Sam Cosgrove’s hot streak in front of goal shows no signs of slowing down as his brace against Queen of the South took him to 16 goals for the season. 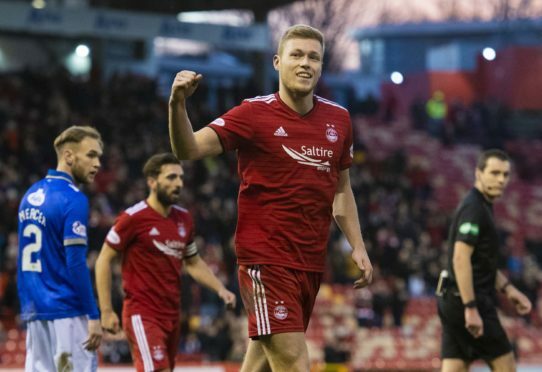 It is now 14 in his last 13 games for the revitalised Cosgrove, who has well and truly answered McInnes’ call for a striker to seize the mantle in front of goal. Manager Derek McInnes reckons his form has helped ease the blow of Adam Rooney’s departure in the summer, which threatened to loom over the Dons’ season if they struggled to find a regular goalscorer. Cosgrove has even assumed penalty duties of late and has displayed a number of the finishes that Rooney would have been proud of inside the box. Cosgrove’s form earned him December’s Premiership player of the month award, with McInnes winning the managerial award, and it earned the former Wigan youngster a contract extension until 2022. Rooney bagged 87 goals in 197 appearances during his four-and-a-half years in the Granite City. He was also the first Dons striker since Joe Harper to net 20 goals in three consecutive seasons. He was allowed to leave in the summer for Vanarama National League side Salford City. The Dons will await their quarter-final opponents in the draw tonight, which takes place after the Ross County-Caley Thistle derby game on BBC Sport. The one downside for McInnes was an injury to right-back Shay Logan, who took a knock to the ankle in the second half and was replaced by Mikey Devlin, who was making his first appearance since the 1-0 win over Hibernian in November. Bar a suspension at the start of the season, which carried over from his red card against Celtic at the back end of last season, Logan has been an ever-present this campaign and McInnes does not have a direct replacement for him in the full-back areas.